Relax into the attentive care of Gavi. As she works with you to integrate your Mind & Body, you will have an opportunity to move through the limitations in your life. You can explore with Gavi the complexity and simplicity of your own personal process in a safe place of rediscovery and respect. 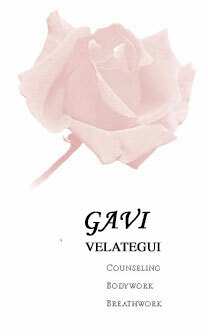 Gavi blends transpersonal therapy, breath and bodywork to find new openings into your healing process. This multilayered work offers an opportunity to address more issues than can be discovered by any one single approach. Gavi invites you to open into your full and creative expression with this transformational work. Come and energize your awakening, evolution, and healing. Special thanks to Brautigam Design.